Chances are you may not have heard of Kirk Knuffke. He plays a thoughtfully burnished trumpet, puts together some singularly baroque-ish and post-boppish instrumental motifs and has the good idea to form a trio with fellow music-makers Doug Wieselman (on clarinet or guitar) and Kenny Wollesen (on drums) for Amnesia Brown (Clean Feed). It’s a set of music where the rather naked trio setting gives all concerned plenty of air and aural presence. They take good advantage of the opportunity. Knuffke writes some very interesting lines to frame the improvisations and Wollesen’s drums gently swing or add color as needed. 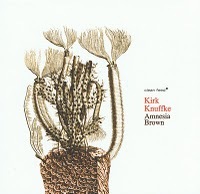 Kirk’s trumpet work is introspective and direct on this date. His sound is bell-like; his note choices well played from the standpoint of gamesmanship as well as execution. Wieselman’s clarinet follows along similar lines and makes for a very appropriate co-frontline voice. His guitar work is filled with loose humor and earthiness. Amnesia Brown burns and cools alternately. It has a mood that inspires contemplation without stinting on musical content. Certainly recommended.